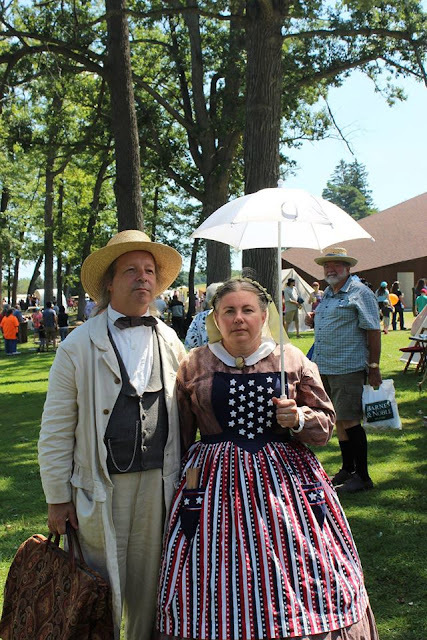 For the first time in a dozen years, my family and I did not spend the entire weekend at the Jackson Civil War reenactment, considered to be one of Michigan's largest events. Instead, we only spent one day. The reason was because Patty and I had to take our son off to trade school/college on the Monday after, and for us to camp for three days only to come home late Sunday evening then have to unpack our Civil War stuff and then repack all of the things our son will need and be on the road again early the next morning was just a little bit too much. I'm stressed just thinking about it! But we made the best of it by day-tripping it...and what a fine day and trip it was; we made sure to enjoy the full "Jackson experience" as best we could by arriving bright and early Saturday morning and not leaving until after the sun went down. 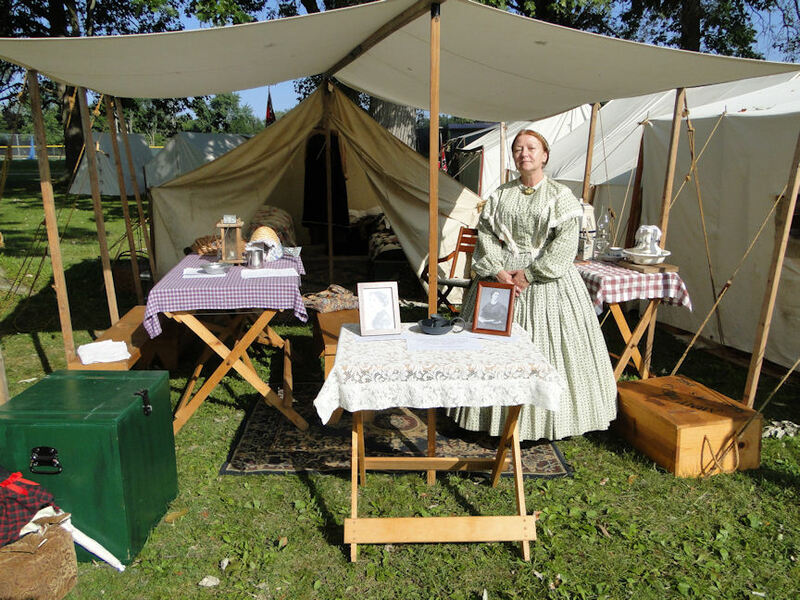 It was very different for me, for normally I am camped in the special impressions area and am counted on to always be "on" for the visiting public. I have been in special impressions for something like seven or eight years now and I always enjoy doing my first person presentations, so I hope to be back in that spot next year when we can, once again, spend the weekend. Since I wasn't tied down to any certain area I had the opportunity to roam about the entire reenactment site with camera in hand and visit with folks I don't normally get to visit with very often. Unfortunately, I missed quite a few people, for they were also wandering and visiting. Glad there's a few more reenactments still to come! Naw…just some of the finest civilian reenactors anyone could ever travel through time with! 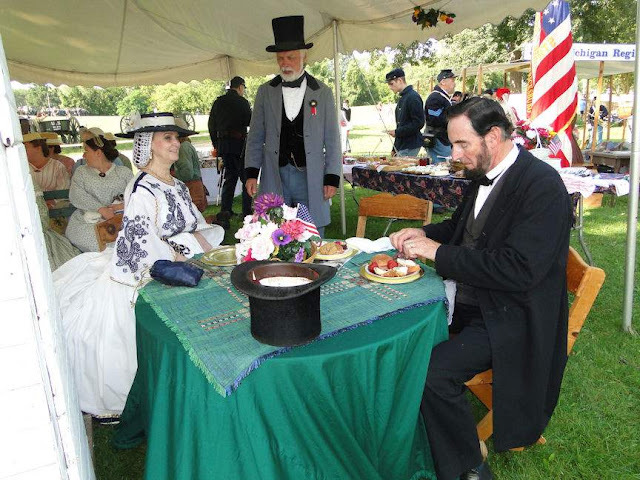 Michigan Governor Blair and his wife enjoy spending tea time with President Lincoln. 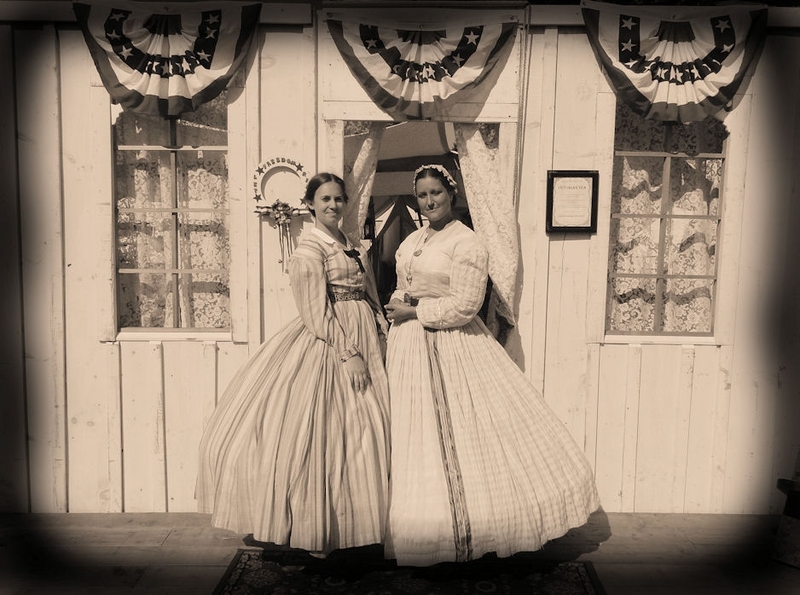 Speaking of tea, Mrs. St. John and Miss Fross held a Victorian tea for visitors...modern visitors. Inside the tea room at the Victorian tea. Two Historical Kens, though the Ken on the left has been reenacting for over 40 years. He does Civil War, Rev War, F&I, and, I'm sure, another era or two. Does he have the stories to tell! 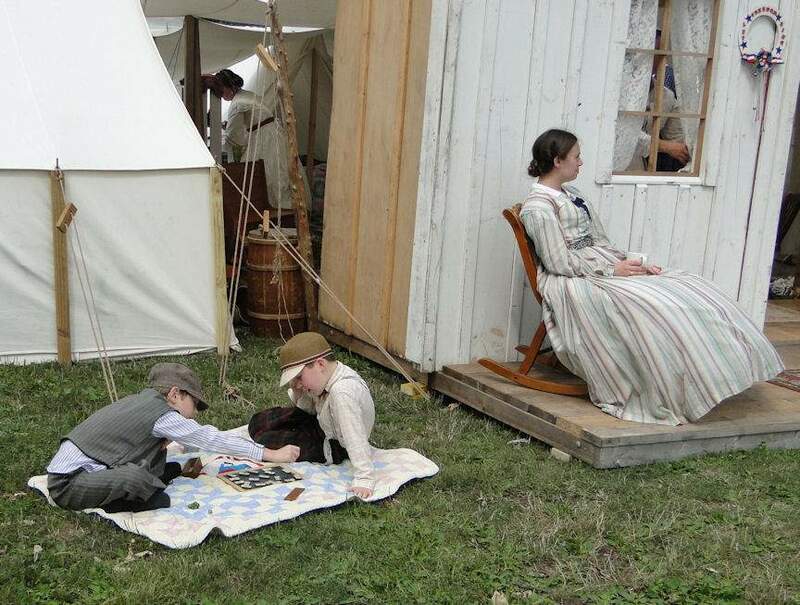 Young 'uns at reenactments is something not seen as often as it should be. It's great when they do the period things kids would have been doing "back then." Three old coots. Ha! Actually, that's me with the carpet bag standing next to two of the nicest guys in our hobby. Yes, he plays period baseball, and yes, he was given that nick-name. Hey! Stop that laughing! Victorian women did not laugh! They never even smiled either. Life was tough for women back then. So stop! Yes, I carry a carpet bag. No I'm not a carpet bagger. If you are a reenactor, you should know better than to ask me if that's what I am, especially if the War is still going on. If you are not a reenactor, maybe you should do some research before calling people such a derogatory name. With the rapid expansion of railroads in the 1840s and 1850s, people were traveling in larger numbers, and there was a need for cheap luggage – carpetbags, made by saddlemakers from old pieces of carpet that were not worn out, filled that need. They came in many sizes and shapes and were sold in Dry Goods stores for $1 to $2. By the 1860s, carpetbags were carried by nearly everyone, from both the north and the south: men, women, well to do, middle class, and those with little means, and also by the locals who only traveled to town from more rural areas to get supplies. During the Reconstruction Period following the Civil War (1865 well into the 1870s) many people from the northern states went south because the opportunities for a person with money were there to purchase land from those greatly affected by the War’s outcome; a northerner could easily travel south and purchase a farm for as little as $25 by only paying the past due taxes. These outsiders (identified by their carpetbag) were called Carpetbaggers, referring to the Yankee who took these advantages. Some of the worst Carpetbaggers were the politicians who used their positions in the corrupt Reconstruction Government to enrich themselves through bribes and other despicable acts at the expense of native Southerners. 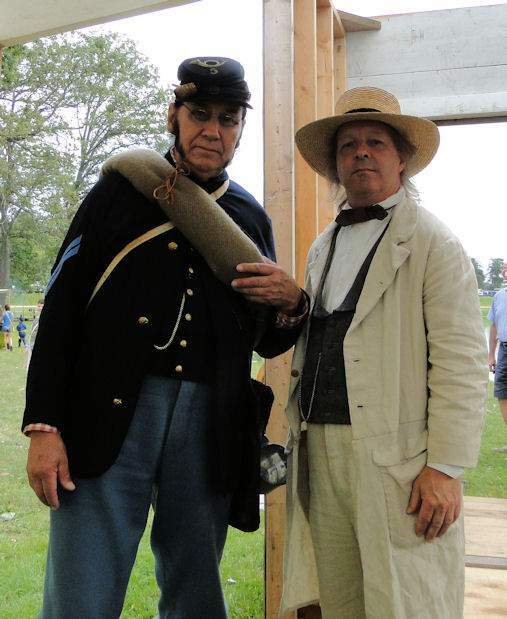 Since I reenact shortly before the Civil War began to shortly after it had ended, I am not a carpetbagger, nor do I like being referred to one from other reenactors. My personality would never have headed south to take advantage of anyone. That is not me and I consider it to be a slap in the face that is comparable to calling anyone who carries the Confederate Battle Flag a racist (which they are not, but you understand what I mean here). Our resident baker and her daughter. Our resident baker's daughter and her beau. Hanging out with "cousin" Charlie! This man is one of the finest living historians I've ever met. No question! The Confederate Battle Flag was alive and well here at Jackson. In fact, I've seen more of these flags this year than ever before. Want to make something popular? Try to remove it or ban it from the public's eye. Yep - it's more popular now than ever before. Good job ya'll! See the gentleman with the white beard? That's Keith Harrison, and this was his final reenactment after decades of fighting the Rebs. The men gave him a surprise fond farewell. The after battle survivors. I, unfortunately, did not get to watch the battle this year. I apologize for not having battle pictures. No, this is not Huck Finn & Becky Thatcher. It's my son and his friend keeping cool in the stream on a warm day. 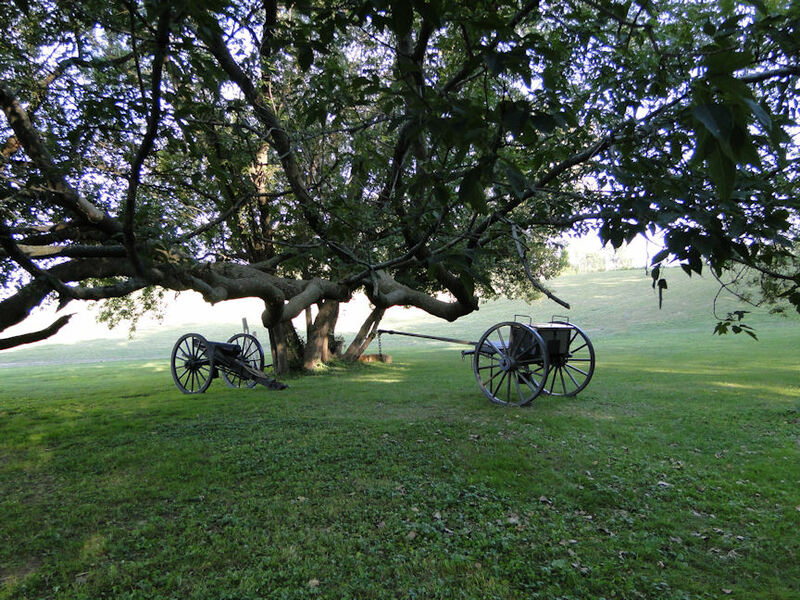 As I made my way across the battlefield in the late afternoon, I just happen to come across this scene, which gave me a feeling of past into present. This is what I saw as I headed into the military camp. Quite a sight, eh? The smoke from all of the camp fires really gave it a very period look and feel. The corporal and the 1st sergeant. The men from the 4th and 21st Michigan discuss that day's Battle of Five Forks. 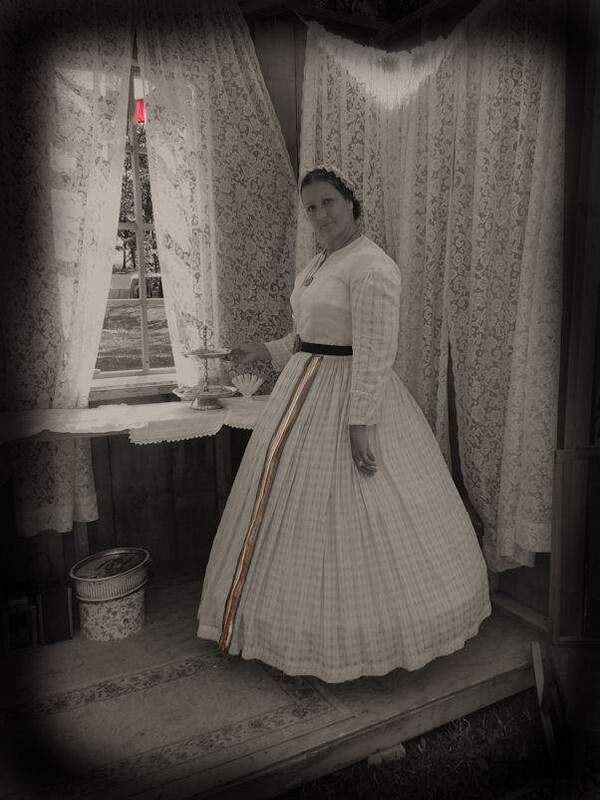 Patty was popular with her period patriotic pinner! I am a (very) basic player of the lap (or mountain) dulcimer. This traditional instrument has such a unique string sound. I need to pick it up more often and practice period tunes. My 14 year old daughter (center) is flanked by two of her 'besties' while attempting to cool off by sitting on a footbridge over a running stream. Yes, this is an actual tintype made by Robert Beech. Larissa had such a busy day that she needed to catch a quick nap before taking the long and bumpy carriage ride home. Rebecca's padded shoulders were the perfect pillow! 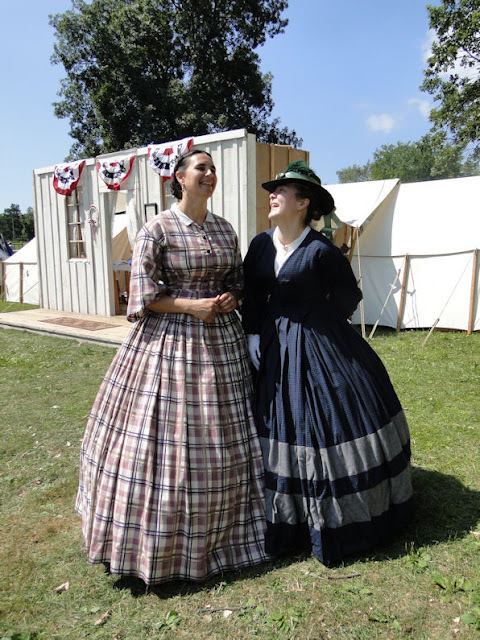 What I really like about the 21st Michigan civilians is that most of us are all pretty darn close friends outside of the living history world. Add to that the fact that they actually like to bring the past to life and are willing to take reenacting that extra mile. And have fun while doing it! 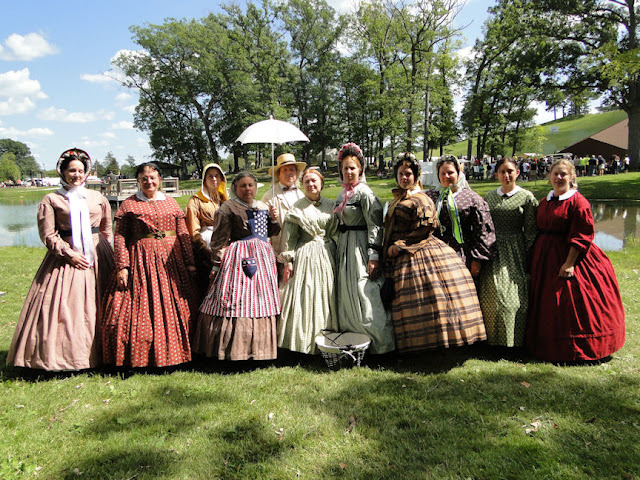 Top notch from the 19th century as reenactors through the 21st century as friends - I love 'em everyone! Sometimes the best part of a reenactment is after the sun goes down. Too bad for those reenactors who change into modern clothing once the public leaves - they really miss out in the full living history experience. Twilight time to dream a while in veils of deepening blue. As fantasy strides over colorful skies, a form disappearing from view. It seems that those of us who day-tripped it to Jackson on Saturday got the better of the two days, for my friends who camped or visited on Sunday were caught in some rain showers. That's a real shame...yep---been there-done that! Hi Ken, Thanks for the pictures. You do such an awesome job capturing the images of the day. Blair and I went on Sunday. Before the battle, I went to the Victorian Tea (for the public) and Blair went up on the hill to watch the Calvary Demonstration. The ladies (and children) put on a lovely tea, so glad I went, and Blair got to see the horses which he really enjoyed. We did leave shortly after the battle so as to not get caught in the rain. We didn't get such an early start to our day, so we didn't get to "explore" much, maybe next year. Thanks again for sharing your photos. Nice recap of the event! Nice! It's a shame people don't want true history anymore. I enjoyed the pictures! It looks like a fun event! I usually have quite a few readers but rarely so many comments! Thank you - I appreciate hearing from you all! Hi Ken, don't forget about me! As always, wonderful post! I enjoy reading your history filled posts and always love all the period clothing, furniture and scenes!